Hello my friend! My latest articles are listed below along with a $6.00 Off Shipping voucher. Simply enter june2012 into the coupon box upon checkout in the Bee Pollen Buzz store to get a $6.00 credit towards any shipping costs on orders of $50 or more. Below you'll read how royal jelly protects your from the sun, honey prevents many diseases propolis may lower your blood pressure AND boost anti-cancer therapies. Royal jelly contains proteins, carbohydrates, fats, free amino acids, vitamins, and minerals. It may have anti-tumor and anti-bacterial activity as well. But now we know that it just might protect your skin from the sun. Propolis continues to show tremendous activity against different types of cancer cells in study after study. This most recent study was designed to evaluate the anti-tumour properties of propolis on several different types of cancer cells in mice. Honey has been shown to reduce the oxidative stress that leads to such diseases as cancer, heart disease and alzheimer's. Find out how honey can benefit your health and prevent disease here. Nitric oxide is a very important substance for heart health. The inner lining of your blood vessels uses nitric oxide to signal the surrounding smooth muscle to relax, thus resulting in vasodilation (the widening of blood vessels) and increased blood flow. Reduction in the bioavailability of nitric oxide plays a significant role in the development of high blood pressure. Without it, you'd have a heart attack. 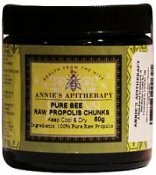 Read how propolis may help with nitric oxide production here.